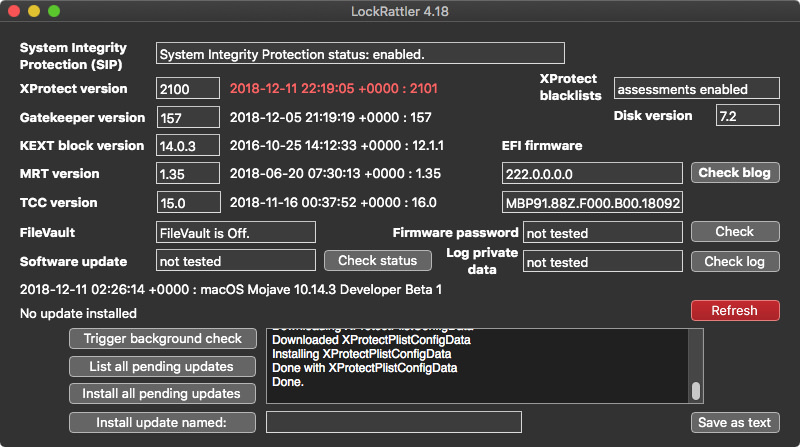 LockRattler displays a lot of version numbers and other information about security updates, firmware, and much more. To help you spot what has changed, here is a new version which should put all changes in red lettering, to make them easier to see. Each time that you run this new version of LockRattler, it looks in its preference file for the results which it obtained last time. If it can’t find any, it doesn’t assume that they have all changed, though. LockRattler then compares the results from the last time it was run to the present. Any which have changed should then be shown in red. This doesn’t apply to every item of data: this screenshot shows its extensive coverage in red. I hope that you find this a worthwhile improvement too. Posted in Macs, Technology and tagged El Capitan, High Sierra, LockRattler, macOS, macOS 10.12, macOS 10.13, macOS 10.14, Mojave, security, Sierra, update. Bookmark the permalink. Per Digita Security, XProtect up to 2101. As usual used LockRattler 4.18 to download and install the security update. Thank you, Phil, for saving me doing my late-night check on updates. I have analysed the update and am shocked to discover that it is just another Flash version increment – no change at all in detection signatures. But it was also the first test of the new red-text alert system in this latest version of LockRattler. As it is impossible to test before a real update arrives like this, I was hugely relieved that it worked exactly as intended. Whew! And thanks for posting an image to confirm that it worked for you too. While putting a new 2018 mini into service, Migration Assistant complained that the migrations source was a newer macOS version, 10.14.2 instead of the shipped version, so I halted the process and did the update using a throw-away user. After the update, Migration Assistant shifted the UserID values from those the old source boot drive. This upset access to all my data files on the external drives. Rather than doing all the labor of finding all the files and folders in numerous locations, I performed a recovery install of Mojave on the new Mac mini. Now that the macOS versions matched, Migration Assistant replicated the old system’s configuration exactly as part of initial boot. This included several soft links to Movies, Music, and Pictures folders on external drives. The absolutely identical operation made the wait for the new install worthwhile. So I recorded the LockRattler output, prefixing the default filename with the local system identifier and saved that file in that system’s configuration folder. After today’s announcement of the MRT update, I checked this new system with LockRattler. The changes (in red) from the original install two days ago were immediately obvious. I again saved the output to the configuration folder, again prefixing the supplied default name with the system identifier. The result was most gratifying. The saved configuration files sorted by date and time as one might desire. Then, using QuickLook in the Finder, I found I could do a blink comparison which made changes even more obvious. I expect that LockRattler output will join EtreCheck output to make running journal entries of the system configuration. I will begin using LockRattler as part of documenting macOS beta testing as well as documenting the client systems I support (family and friends, not as income source). I am delighted with Howard’s continuing effort to obsolete many of my home-brew tools. This, along with his quixotic efforts to document Apple’s vagueries, continue to make supporting multiple macOS systems easier and more effective. I must admit that I was very impressed that the red highlighting worked at all (there’s no way to fully test it before release), and that it has proved so useful. I got a “Failed, error = 1” in the XProtect blacklist field. Any thoughts? That usually means there’s a macOS problem. Which version of macOS is this? You can check the XProtect file yourself: it’s at /System/Library/CoreServices/XProtect.bundle. Even in the Finder you should be able to read its version number.